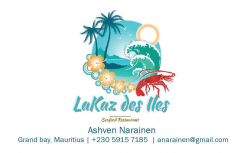 LaKaz des Îles Restaurant is specialised in Seafood and proposes Fresh Alive Lobsters/Crabs, & offers panoramic views of the sunset over the ocean ☼Description de l’entrepriseLaKaz Des Iles Seafood Restaurant is situated @ the ground floor of Azure Beach Boutique Hotel. Azure Beach Boutique Hotel is the ideal opportunity for you to enjoy the affordable luxury of a 3-star boutique hotel ideally located in the heart of Grand Baie. The hotel offers all essential amenities along with a high standard of hospitality and personalised service by very friendly and professional staff. Ideal for party animals, families, couples or even groups of friends, the Azure Beach Boutique Hotel is a cosy hotel that caters to virtually every guest. The hotel provides comfortable accommodation with 14 well-equipped guest rooms featuring free Wi-Fi, flat screen TVs, in-room safes, hair dryers and coffee/ tea makers. Additionally, you can benefit from an on-site bar, restaurant and café. Azure Beach will place you right across the most prized spot in Grand Baie, the Sunset Boulevard shopping centre, within walking distance of Le Lucky Strike and Grand Baie Coeur de Ville. You will also have access to a wide range of restaurants, clubs and bars. The Azure Beach Boutique Hotel’s excellent location and facilities makes it a great value for money package. If you’re on a budget and looking to have a fun getaway, this hotel is perfect for you. alive lobsters, alive crabs, octopus, king prawns, prawns, calamari, giant clam, greenshell mussels, red snapper fish, capitaine fish, variety fish, etc..
Recherche MAITRE D'HOTEL (H/F) à LaKaz des Îles Restaurant, Grand Baie.